Morning Star’s purpose is to make a positive difference in the lives of our residents by providing compassionate care in a safe, stimulating and family-oriented environment. From companion services and live-in care to our residential care facilities, we have your loved one’s comfort and happiness in mind. At Morning Star, we offer services both in your home and in our three facilities. Each of our clients is provided a comprehensive plan of care that is created and closely managed by an RN and LVN. With more than 20 years of experience working with seniors, Morning Star strives to provide reliable services for your family member. Our team of highly dedicated caregivers is thoroughly screened, trained, bonded, insured and ready to deliver exceptional care. For over 15 years Morning Star has served the senior community of the Coachella Valley. Owned and operated by a Registered Nurse and Licensed Vocational Nurse, we focus on the health, happiness and well-being of our clients. For us, each client is a valued member of the household and we work to ensure this with honor and respect in everything we do. 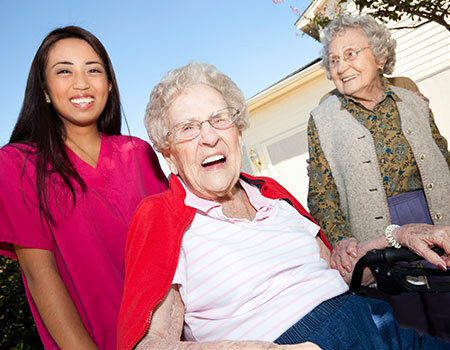 Our team of dedicated caregivers is highly trained, licensed and insured assisting each client according to their unique and individual needs and desires. Each facility offers thoughtfully designed and furnished bedrooms including attractive furniture, linens and a TV, we invite each client to bring their personality and mementos in. Families and friends of our residents are always welcome and encouraged to visit frequently and to participate in ongoing activities, birthday or holiday celebrations or simply to join us for a meal. Morning Star is pleased to offer care in your home or one of ours. We have three locations – two in Cathedral City and one in Rancho Mirage.